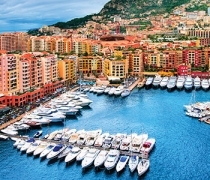 The Monaco GP is the highlight of the F1 calendar and considered one of the most glamorous sporting events in the world. There is no better way to view this demanding street race than from the deck of a luxury yacht, moored literally metres from the track. Our yacht packages include outstanding hospitality from the moment guests step on board. Enjoy premium Champagne all day, fine wines & beers complimented by a lavish gourmet buffet on each day. We always go the extra mile to meet the needs of our guests to make sure their Monaco weekend is one to remember - the ultimate place to experience The Monaco GP.